When it comes to crafting I feel like I achieved quite a lot this month, probably because this is the first month in a long time that I have been a completely selfish crafter and made some excellent geeky stuff which, more often than not, gets put to one side. I certainly smashed this month's plans and then some! 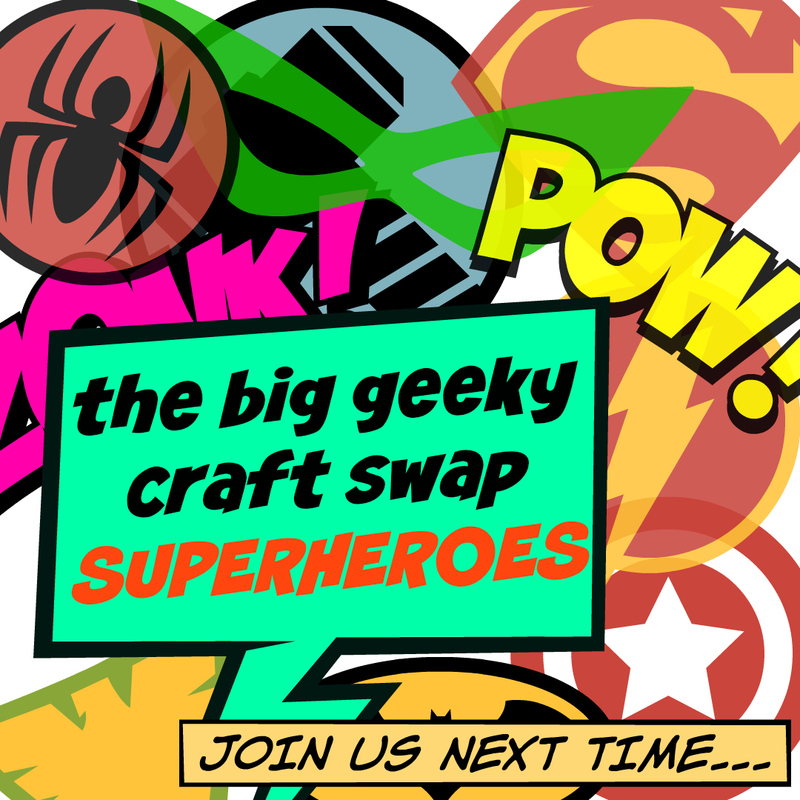 Let me tell you though, when you see what I got up to this month I hope you will agree that geeky crafting is the best crafting (for a geek like me anyway!). Also, I don't know about you, but has this month felt looooong or what!? 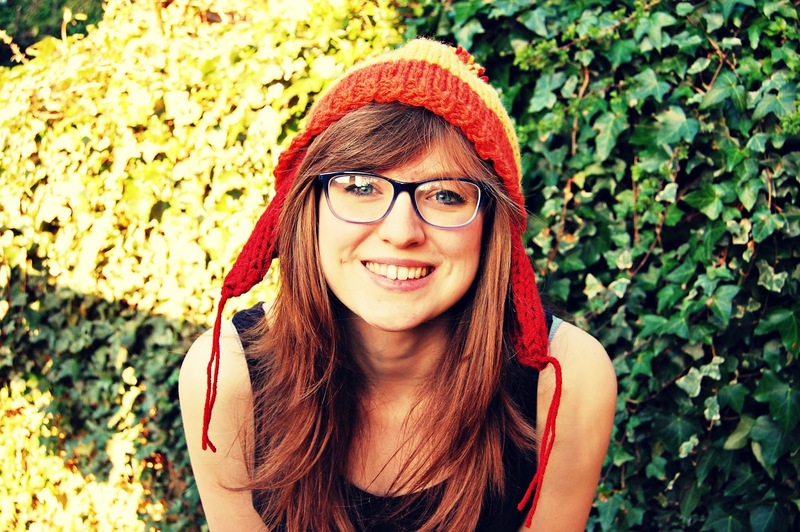 This hat was such a joy to knit! The colours are so bright and you hold the yarn double so it works up quickly and soft. Not to mention that I've been guiding my dad through all of the episodes of Firefly this month which adds to the excitement of finally knitting my own cunning hat! If you want to knit a hat like this I can't recommend this pattern enough, and you can read more about my hat here. I managed this 2.5x, if that's possible! First this month I was inspired while playing Pokemon X to design a pattern for Azurill - one of the cutest baby Pokemon around - and I am so happy with how he turned out! And once I'd finished him I couldn't wait to finally make my own baby Squirtle based on the picture I shared earlier this month. Just look at him up there! I couldn't be happier, he is adorable! I took a few pictures so I will share more pictures of him next week! And finally I also had some colours left over from the Jayne Cobb hat and decided what would be better than making a Magikarp. I am using this pattern and he is going to be HUGE! I can't wait to finish him and show you. 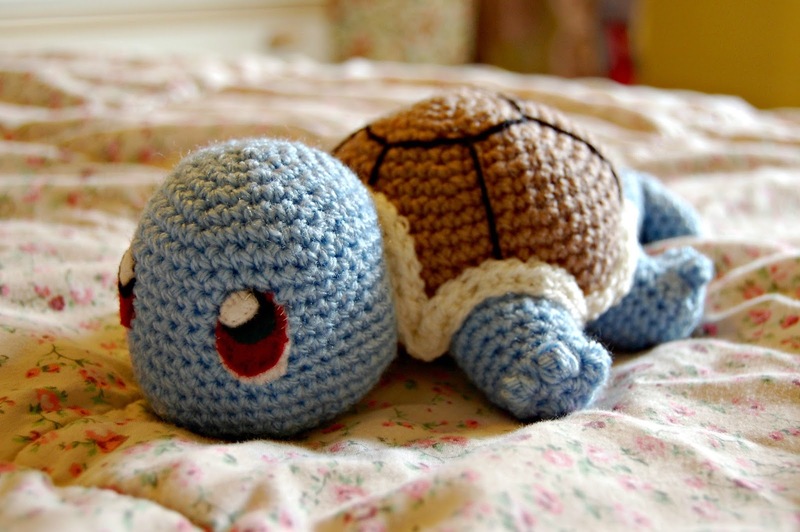 If you would like to crochet your own Azurill, use my free pattern here, and you can find the free pattern for Squirtle here. Now, what do I want to make next month...? 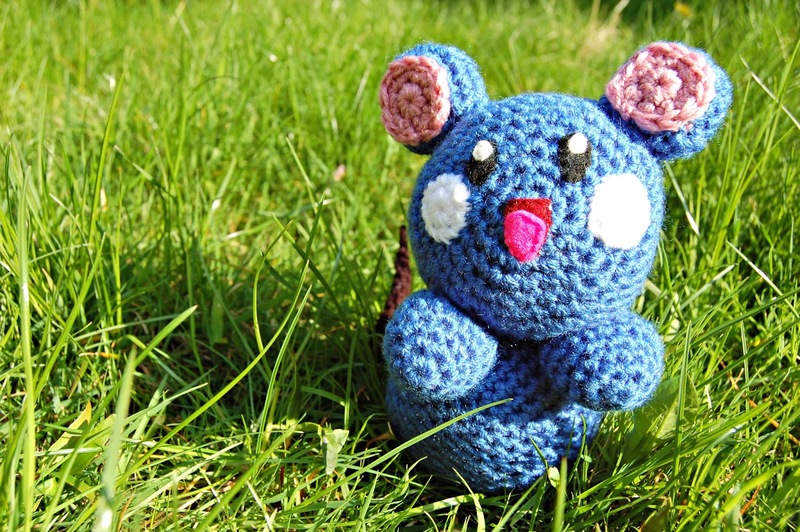 For any Pokemon fans out there you can use this free pattern to crochet your own amigurumi Azurill! If you don't know Azurill this is the baby Pokemon that evolves into the slightly better know Marill who was first introduced in the show not long after Ash lost in the Indigo League and travelled to the Orange Islands, meeting a new companion Tracy. Azurill was first introduced to the games in Generation III - you can read more about Azurill here - and I decided I wanted to make him since I caught one on Pokemon X and thought he was cute and would make a great pattern! This, as well as looking to make at least one Pokemon this month as part of my crafty plans. Perfect for a beginner, intermediate, or experienced crocheter, Azurill is worked in the round with DK yarn held double. All terms are written using US crochet terms (e.g. a 'sc'/singe crochet is a UK 'dc'/double crochet). Close opening, fasten off and weave in end. Close end, fasten off and leave a tail for sewing to the body. Chain 5 stitches and join with a slip stitch to the first to make the first round. Then sc round, working round the pipe cleaner (you will eventually crochet the whole pipe cleaner into the piece, so I found it easier to crochet round as you go rather than struggle to squeeze it in after). This should take approximately 30 rounds. Fasten off, enclosing the pipe cleaner. 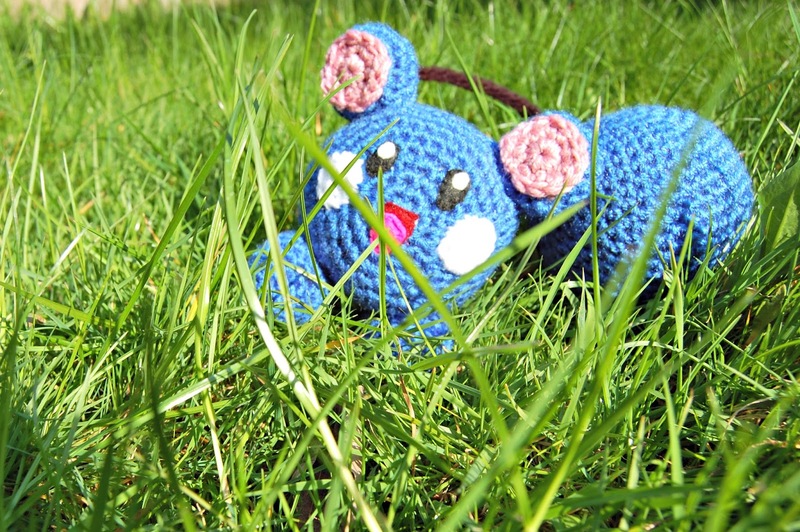 be careful - Pokemon like Azurill like to hide in tall grass! - Sew the pink ear parts onto the blue ears. Position on Azurill's body and sew into place. - Cut out Azurill's facial features (eyes and mouth) from felt. Position on Azurill's face along with the cheeks and sew into place. - Position and sew the feet onto the bottom of the body. - Sew one end of the black tail piece onto the 'tip' of the body. Sew the other end to the blue tail piece. At this stage you could bend the pipe cleaner into a zig-zag which matches the cartoon more accurately! And now you have finished Azurill! 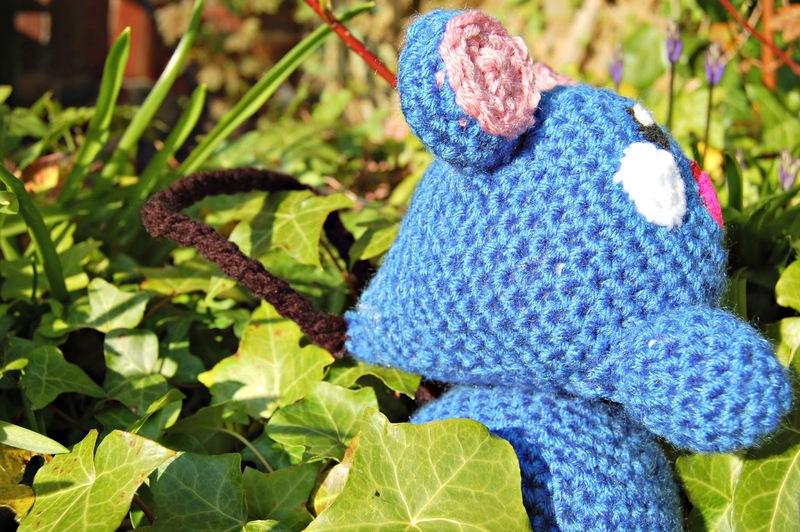 If you make him please do share pictures in the comments below, over on the Ravelry page or Instagram! Enjoy the pattern and don't hesitate to get in touch with any questions! This pattern is for personal use only, please do not sell items made from this pattern. Please do not republish this pattern as your own/without permission. Inspired by the perfect show that is Firefly (if you haven't watched it yet OHMYGOSH please do - UK readers, it's on Netflix go go go) this is the cunning and shiny hat that Jayne Cobb receives from his mum in the episode 'The Message'. This hat has become a cult-icon and was something I was very excited to knit when I decided it would be one of my crafty plans for this month. I am again linking up with hardknitlife's Freshly Finished Friday - check out this weeks post and link up here. The pattern is a brilliant free pattern which is very clear and easy to follow, and even had the genius idea of picking up stitches on the inside of the hat for the ear flaps, rather than knitting them separately and sewing them on (tricky what with the 3 distinct colours). I was very keen to get this hat as right as I could as I was allowing myself to buy yarn in for it, even though I am on a little yarn-buying-ban. The suggested yarns are a bit of a mismatch (one can only assume the designer was using up their stash - good on them!) and a bit expensive. I had a pretty good idea that I wanted to use Lion Brand Vanna's Choice, knowing that the yellow they offer is just right, it is a good price (not too cheap, not too expensive) and feels gorgeous when knitted. After trawling through the project notes to find the correct corresponding colours, and seeing a few other people use the same with great effect I got to ordering! 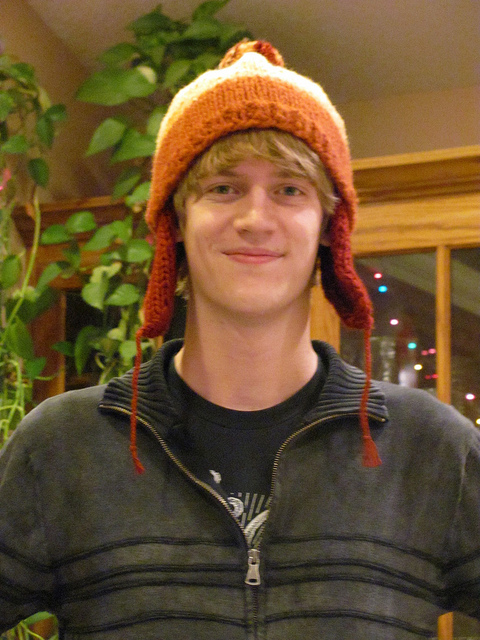 I knit this hat in the round on 9mm circular needles, holding the yarn double. This meant it was a very fast knit and was cheerful too as who can't help but smile when knitting in such bright colours! My sister's boyfriend chuckled a lot at me while I was working on this because, if you aren't a fan of Firefly, perhaps the style and colour choice are a little odd. I personally feel it is full of character though. The fit of the hat is perfect. I was worried it would be on the large side (even though I checked my gauge twice to make sure it would fit! ), but it has turned out to be a very comfortable fit, and I dare say perhaps a little stylish? Though a tad unseasonal with this gorgeous sun we are having in the UK right now! 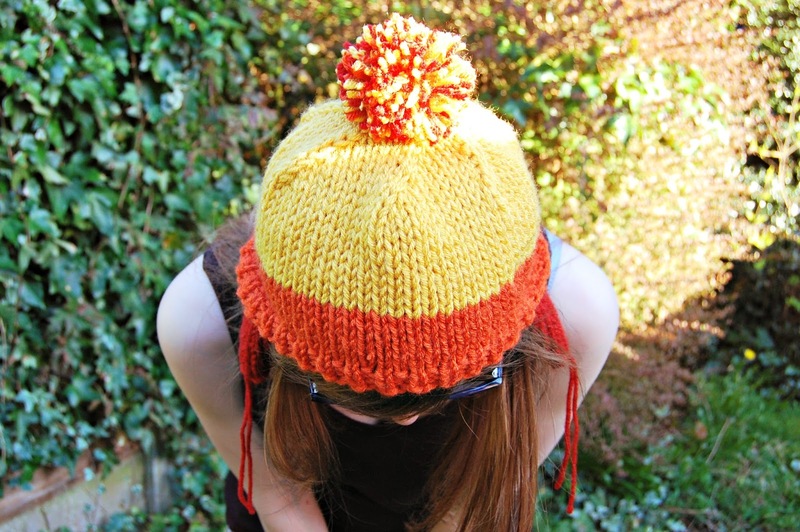 If you aren't a fan of Firefly but wanted to make a hat for when the weather turns again I would suggest this pattern and simply changing the colours for whatever you fancied! And perhaps finishing the tassels, or losing them entirely (that unfinished look is part of the hat in the show). And if you are a fan of the show, then I can't recommend this pattern and yarn combination enough! Deramores was the first website I ever tentatively ordered my supplies from when I branched out my knitting and crochet horizons, and I continually go back to read their blog and perhaps, very occasionally, buy something ... hear my guilty tone in that last part? 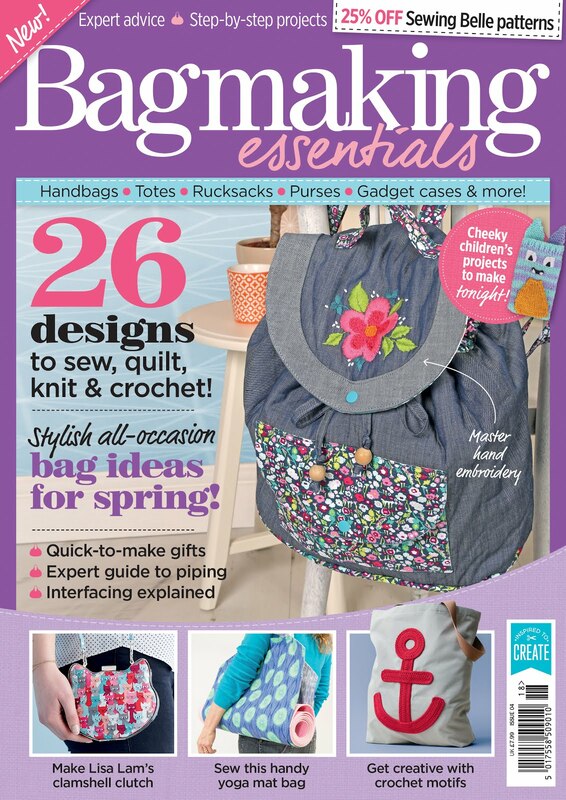 They announced at the end of March a blog competition in association with 6 well known bloggers (5 of whom I already read regularly) about the trends we can see and expect from yarn crafts throughout 2015. There is a notable crochet trend going on when you read what the bloggers have to say on the subject. I was very happy to see Kat of Slugs on the Refrigerator pick up on DIY fashion. 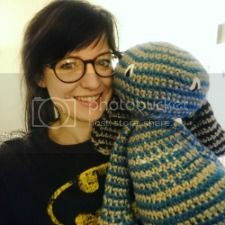 More specifically Kat writes about crochet garments and their growth in popularity in recent months, even years, and share some beautiful pictures that are giving me a serious itch to grab my hooks as soon as I can! I completely agree with her points that perhaps people who have long stuck to home wares and accessories are now, with the help of the internet and forums such as Ravelry, experimenting with crochet garments. Personally I am sure that Pinterest must have a huge hand in this, inspiring people so easily to seek out and try new things and making it so much easier to share exciting project ideas. My favourite thing to search for on Pinterest for example is granny square projects. Initially this began as a search for inspiration to start a new blanket at some point, but the amount of accessories and garments that one could make with the simple and traditional granny square alone astound me! In particular I am keen to try and crochet a granny square jacket, inspired by the colours and designs of just a few of the ones available to try. There are three amazing things about these granny square jackets in particular that gets my creative side very excited. The first is that even though they are using a traditional design, nothing looks dated, you can make these look very modern and stylish (though I would have to make an impeccable design to wear it out of the house! I'm thinking a lounging round jacket..?). Second it looks so easy to make up your own pattern for one of these jackets so that you can really make something tailer individually to you. And finally if you are like me and don't mind (or even embrace) the fact that I can be and look a little eccentric, then this is an excellent project to bash that stash and use up some of the mountain of yarn all knitters and crocheters inevitably acquire, even making this an economical project. I still haven't had the guts to try and make one of these jackets yet, as it will take careful planning and some design choices, plus I'm too eager to make everything else under the sun as well. But I am determined to start hooking one up before the end of the year! And that's not to say I haven't been busy embracing the DIY fashion trend myself. 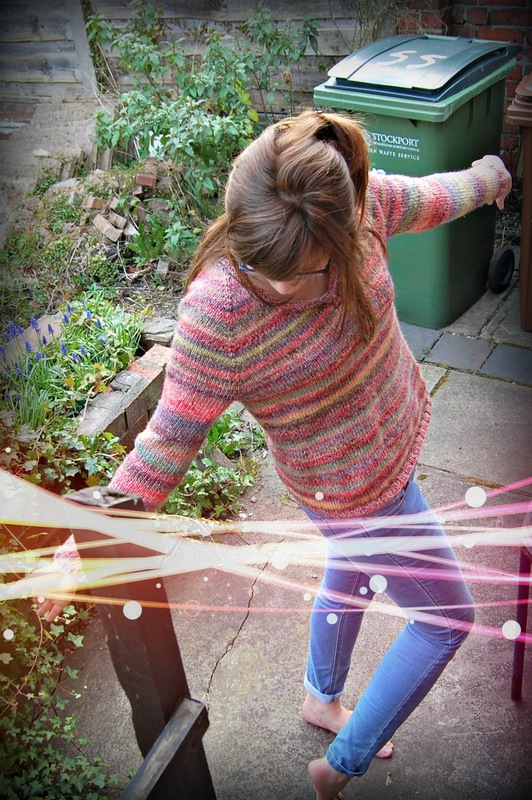 Last year I sewed myself a skirt, and knitted a practice cardigan, and more recently I finished knitting a wonderful jumper that was the result of a previously failed knit. Another splendid thing about DIY fashion (particularly knitted and crocheted) is that if you aren't happy with the finished project who is to stop you from ripping it out and giving it another go! As soon as I finished the jumper I was so relieved and happy that it went right that I've dived straight into garment knitting again and cast on a garter stitch cardigan! This is fuelled no doubt by my long desire to knit my own clothes, but also by the trend for DIY fashion and the resurgence in crafting across Britain (evidence no doubt by the popularity of shows such as The Great British Sewing Bee). I simply can't wait to make more of my own garments! What do you think - are crochet garments and DIY fashion 'on trend' for 2015? This post is my submission to the Deramores Craft Blog Competition 2015. Deramores is the UK's number one retailer of knitting and crochet supplies. Visit www.deramores.com for more details. I love the neck line on my latest knit! Finally I can show you the jumper I cast on as a result of really disliking the first jumper I knitted this year in February. I don't think I have ever knitted 2 such large projects in such a short space of time, even if the first once was unravelled in order that the second should live! 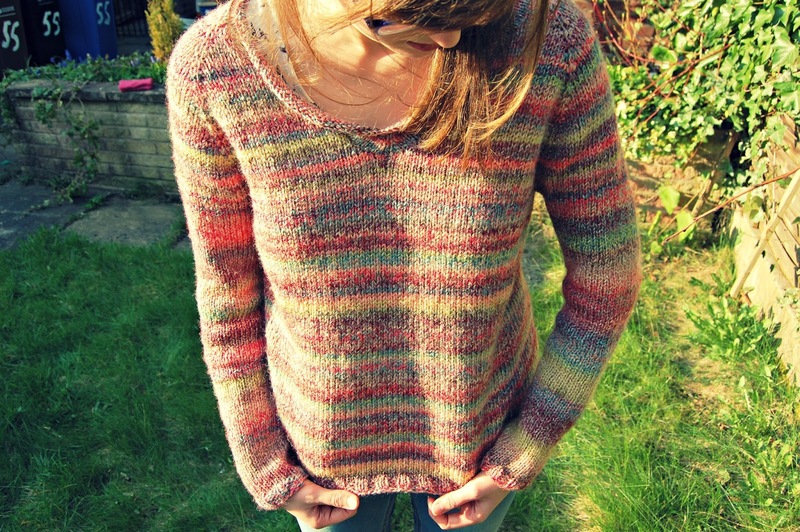 Also for the first time I am linking up with hardknitlife and the marvellous idea that is Freshly Finished Friday! Click the link at the bottom of this post to find this week's link up and to share any projects you've finished this week. This was a particularly tricky pattern to follow, although I am incredibly pleased with the end result! 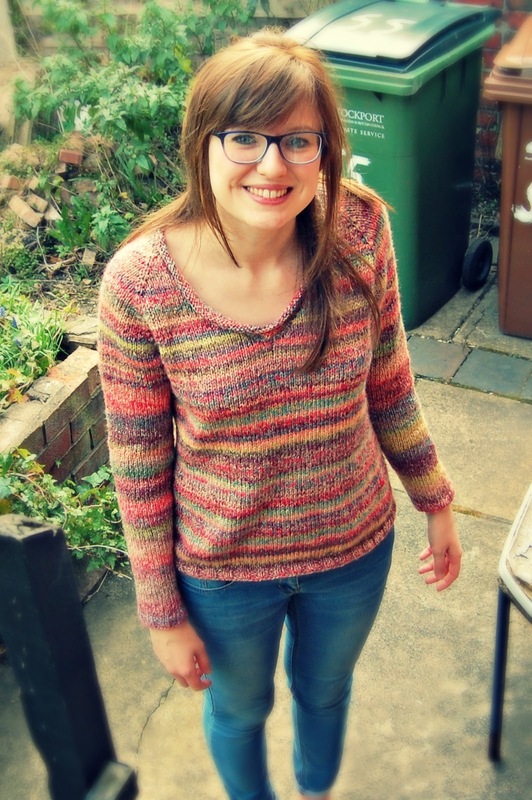 Described as a summer tweed pullover, my James C. Brett yarn worked beautifully to the gauge and knitted up in some lovely bright stripes, making this more of an Autumn/Winter garment. This jumper is intended to fit with positive ease, but to play it safe I knitted the ladies' medium size as I wanted a loose, comfortable jumper. The pattern is perhaps awkwardly worded and takes a little bit of working out to understand, and was a big ask of myself for my first ever top-down-in-the-round sweater. A lot of people on Ravelry were writing that they had to handwrite the pattern or type it row by row on a spreadsheet to work it out! But I muddled through with a pencil and many tally marks, and after a few attempts/cast-ons I got the hang of the way it is written. The pattern is worked entirely in stockinette stitch. I added about 4 rows of 2x2 ribbing to the bottom of the body and the sleeve cuffs though so as to prevent rolling. Rolling was intended as part of the original pattern but I wasn't keen on the idea of that myself. 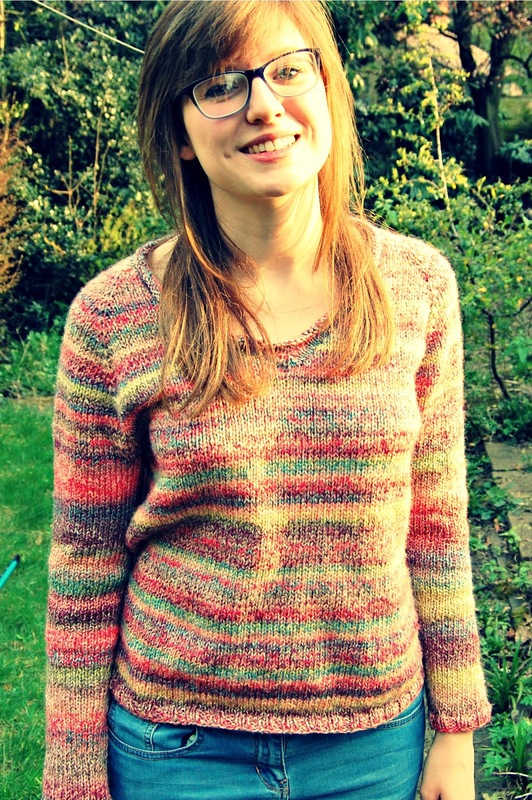 As difficult as the pattern was to understand in the beginning, now that I have finished I understand what I am/was doing so much more and I would happily consider knitting this baby again in a different yarn, perhaps something a little lighter would make for a more summer appropriate jumper? Also I feel this is a pretty top notch finished project considering the pattern was free! All in all I am incredibly please with this and I hope you agree! 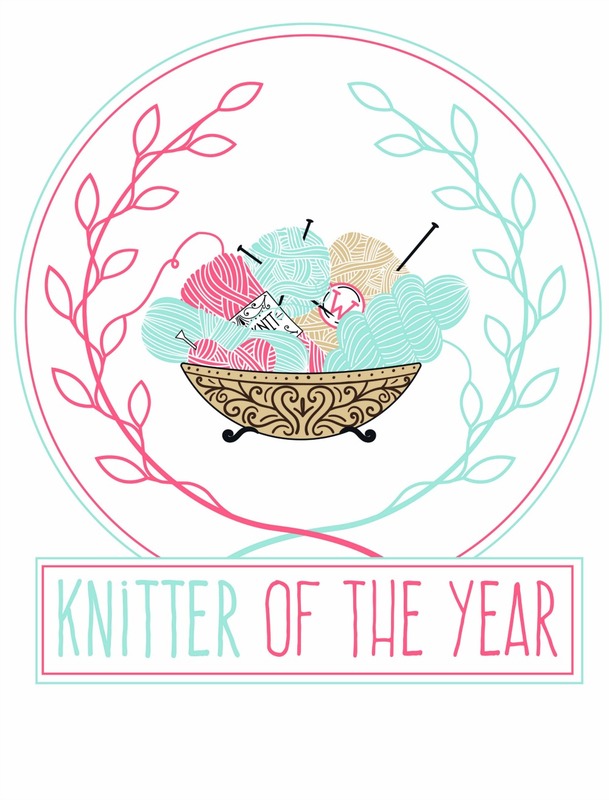 Here is to the wardrobe of jumpers to be knitted yet! 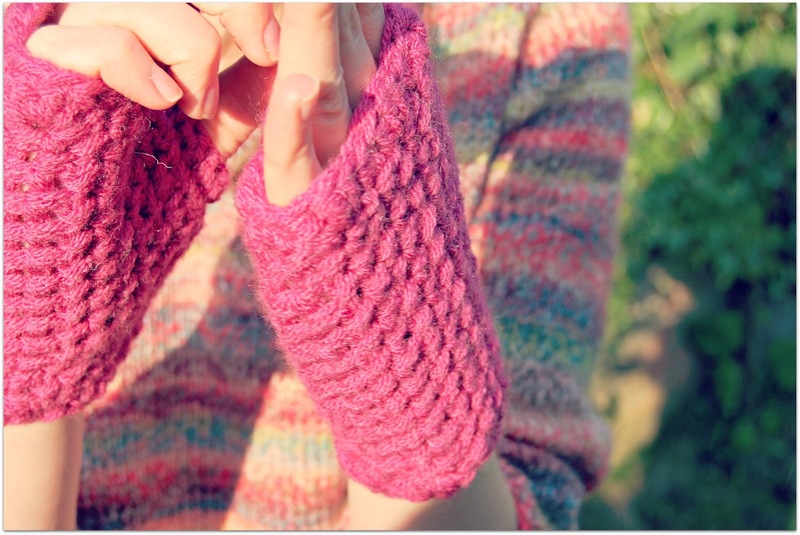 Linking up with hardknitlife- Freshly Finished Friday #14! B's mum surprised me with a little gift, a month or two ago, of the Crochet 2015 Calendar. A day by day calendar sharing, you guessed it, over 100 different crochet designs! What a perfect way to map the days. As you might imagine with so many patterns not all of them necessarily peak my interest, but many of them do and the very first pattern featured in the calendar is the Lava Wrist Warmer - perfect for me who is always on her iPhone out in the cold! The picture in the original pattern actually uses a dark grey Aran wool that looks really classy and would match any outfit, but I am trying not to buy any yarn for a few months (going reasonably well!) and I had plenty of this lovely pink Stylecraft yarn left over from a shawl I had crocheted as a Christmas gift not long ago. So I doubled it up to get the correct guage and settled down to crochet while watching Guardians of the Galaxy last month. This pattern is realy fabulous. It was easy to follow and I really liked the granite stitch effect which I have never used in crochet before. The resultant texture is very similar to a knitted seed/moss stitch which is one of my favourite textures to use when knitting. 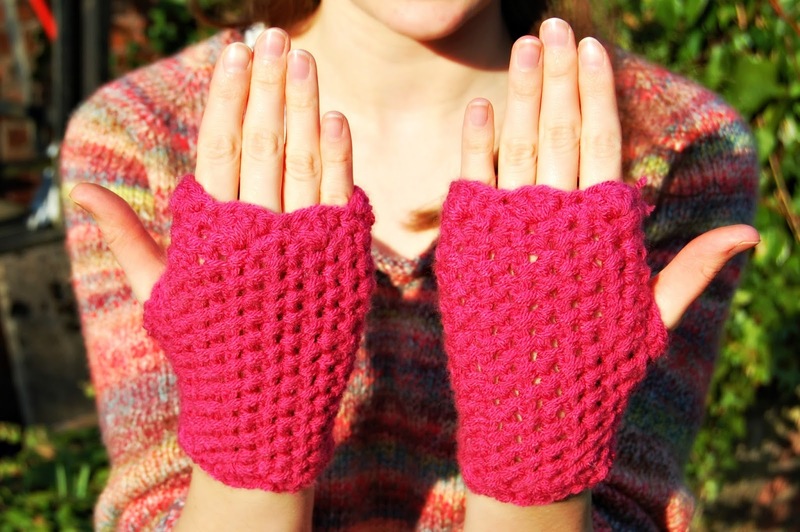 The edges are finished with a simple shell stitch to give it a nice, organic but neat edge. I struggled identified the row counts to do this stitch I must admit, but with most crochet projects you can muddle through and everything is ok! These worked up really quickly (they only took the one evening, and the one sit through Guardians of the Galaxy) so they were a perfect break from knitting my new jumper, which incidentally I am wearing in the pictures above as B was helping me take some pictures of both these finished projects! 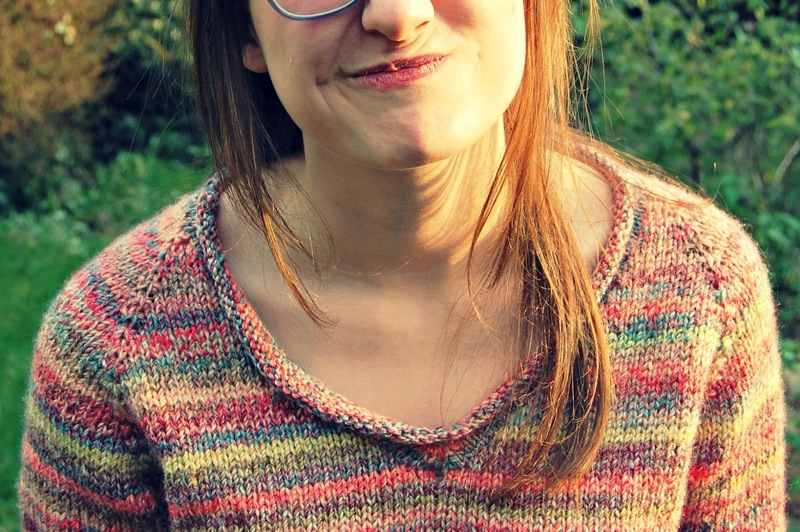 I will be writing about the finished jumper soon, I just get so self concious in pictures! My hands are different though. It doesn't look like this pattern is available online which is a shame because it was such a satisfying and quick project. There was one odd instruction in the pattern when sewing up to make the thumb holes, which it turns out there is errata for, but I muddled through myself! I've also managed to wear the warmers a couple of times before the spring weather sprung out of nowhere here in the UK, they fit beautifully and look pretty good with my dark navy coat! 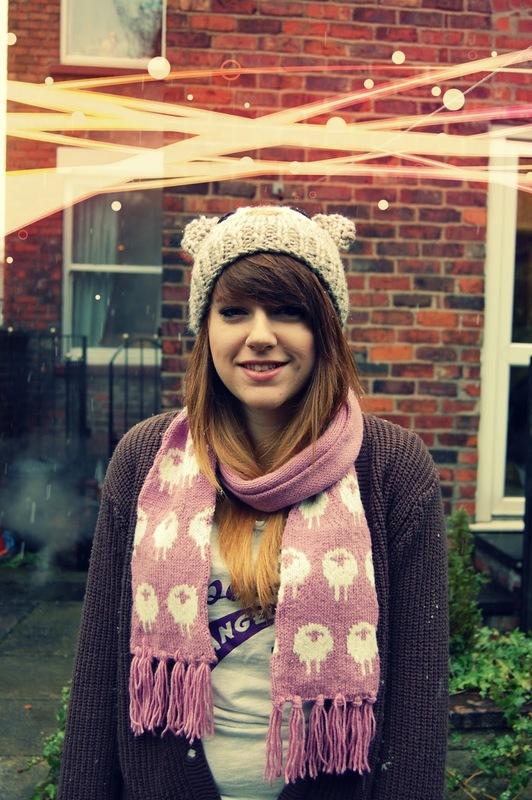 On 29th March 2014 I took the advice from Soph from work and I started this blog. After a year of writing this blog, making new internet friends and discovering just how huge and inspiring the world of blogging can be, I can't believe just how much I love doing this! I've felt my creativity stretch further than I imagined, including writing and sharing my own patterns. I've discovered such a love for this that I'm fervently searching for jobs that would match writing, editing, and knitting (ideally). I just wanted to use this post to say thank you to everyone who reads my blog and who say lovely things about it and the things I make! To finish up here are just a few of my favourite posts shared over the last year, and here is to the next year (and more!) of blogging and pattern writing. 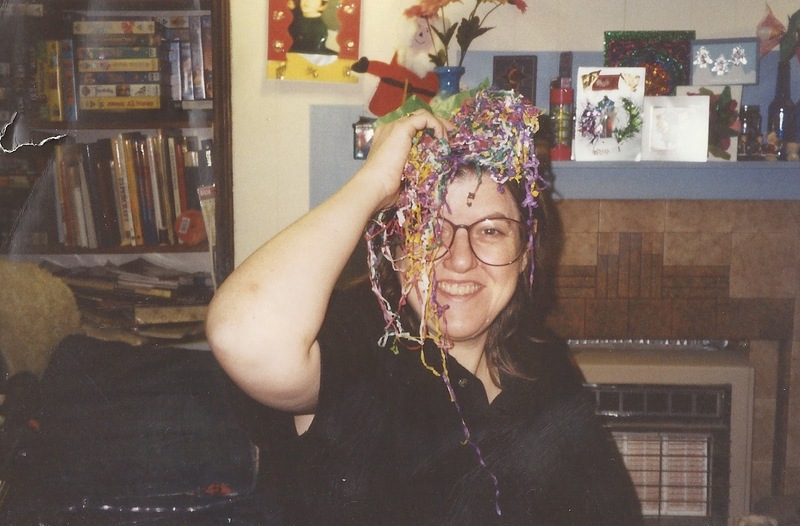 crafty inspiration - my mum ; this post took a long time to write and a lot of heart went into this, but something I felt I needed to do as a tribute to one of the most wonderful and inspirational people in my life. a realisation (or 'a crafty ramble by jenny') ; this is a post that rambles somewhat, but I do love to write in rambles and let my ideas spill out as they come. This is about realising I didn't want to sell at fairs but instead focus on writing patterns. owl hat - free knitting pattern ; I loved taking pictures of my gorgeous sister for this pattern, and I had a lot of fun preparing the pattern and sharing it. It was a hat I had made many times before and hadn't really planned on writing a pattern, but I am really pleased I did it was the first thing I ever knitted without a pattern! #dicraftswap - disney ; last year I took part in a number of monthly craft swaps hosted by Hannah, and really had a lot of fun deciding what to make and crafting out of my comfort zone. For the Disney swap I was particularly proud of the cross-stitch I did! #worldcupcraft - the final! ; the culmination of a knitting challenge I set myself while B and I watched football over the summer, a knitted cardigan that actually fit! Thank you again for all your support! Do you have any favourites from my blog? At the start of every month I set myself a couple of 'crafty plans' for the month ahead in order to challenge myself and to structure what I get up to. This month I already have an order to knit one of my infinity scarves, and I have been feeling particularly geeky and excited about comic con, so it is two pretty easy challenges this month. The whole reason I taught myself to crochet over 3 years ago now was because I saw many gorgeous pictures online of crocheted pokemon (just look at my Pinterest board if you need evidence), and to this day although I have made a handful I haven't made any for myself, nor have I made any of my favourite pokemon. I am finally going to treat myself to Pokemon Y tomorrow for the Nintendo 3DS (pay day yesterday woop) and in honour of this, as well as almost completing the Indigo League on Netflix this weekend, I finally want to crochet myself my own little Pokemon. And I stumbled across aphid777 at Deviant Art on Ravelry while looking for some pictures for this post and fell in love with all of these designs! B got particularly excited about Squirtle, but I love the Eevee with all my heart! I think I will be using one of these, if not a couple, this month! 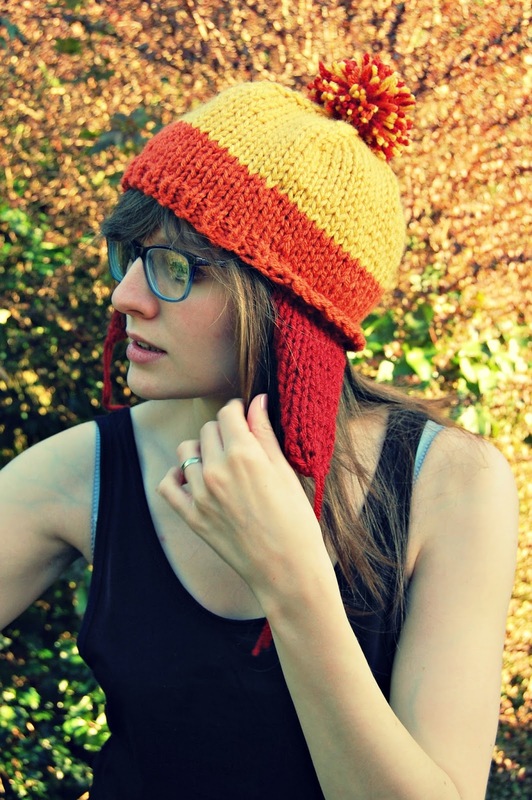 I, as well as many others, love Firely with all of my heart and have for the longest time wanted to knit the infamous Jayne Cobb hat! Chatting with B earlier today we decided that, because of receiving an unexpected bonus at work, I was allowed to temporarily lift my no-yarn-buying ban and I can purchase the yarn needed to make this hat! I will use this pattern, and then I can wear it to Manchester Comic Con a couple of months after the London one - woo hoo! I can't wait to make this, and I might even make it fast enough to wear in this miserable weather we are still having. Have you got any crafty plans this month?